Plantains are a cultivated variety of bananas in the plant genus Musa. They are known as cooking bananas because they are eaten cooked as a result of the fact that they are starchier and less sweet. Although a botanical fruit, plantains are used as a culinary vegetable and are about as nutritious as potatoes. They contain good amounts of potassium and magnesium which promote healthy blood pressure levels and sustain muscle activity. Plantains have a varied B vitamin profile, with generous amounts of vitamin B6 which makes them a good food to eat for skin and mental health. The fruits stand out as good dietary sources of vitamin C, providing benefits for skin and immune system and are an important source of carbohydrates for energy metabolism. What are plantains? Plantains are a hybrid banana variety. They are the result of a cross between two ancestors of the modern banana: Musa acuminata and Musa balbisiana. Both plantains are bananas are scientifically called Musa paradisiaca. Any modern cultivated banana species that has a relatively firm pulp and starchy-tasting fruit is called a plantain, or a cooking banana because of its higher starch content which renders it more palatable cooked. From a botanical point of view, plantains (and bananas) are berries. From a culinary point of view, the green, unripe ones are considered vegetables, while the golden-black, ripe ones are considered fruits. What is the difference between plantains and bananas? The main difference between bananas and plantains is their starch to sugar ratio. Simply put, plantains convert less starch into sugar as they ripen and are thus less sweet. Bananas convert more starch into sugar as they ripen and this makes them quite sweet. This difference in taste is also why plantains are called cooking bananas and sweeter bananas are called dessert bananas. Usually, plantains have a thicker skin that is harder to peel, while bananas have a medium-thick skin that is easier to peel. Plantains are often eaten unripe, while still green, while bananas are eaten only when ripe. Since it’s a higher starch content you look for in a plantain, you eat it when it has the most starch, so when it’s still unripe. The same is true for bananas: since you are looking to enjoy a sweet fruit, you eat desert bananas when they are ripe and at their sweetest. Because there are so many different Musa species, each with a varying ‘content’ of plantain or banana in them, the names are often used interchangeably to denote specific characteristics of various cultivars. For example, the sweetest bananas are called desert bananas, but some less sweet desert bananas may be called cooking bananas or even plantains. Similarly, cultivars with the highest starch content are called plantains, but some slightly sweeter plantains may also be called sweet plantains or bananas when ripe. And since there are so many different cultivated species, it’s not always easy to tell the difference between plantains and dessert bananas. See Difference between Banana and Plantain. What do plantains look like? Plantains are larger than most desert bananas. They have a curved, boomerang-like shape and considerably thicker, leathery peel that gives some cultivars an almost square aspect when looked at from the tip. Being a cultivated fruit, the plantain has few, tiny, brown-black seeds that run lengthwise in the center of the pulp or is seedless. At the stage at which they are eaten, plantains are unripe and thus have a uniform bright green colored peel and pale yellow pulp. But they don’t stay green. Given enough time, they ripen and turn golden yellow then black. When the peel turns mostly black, the plantain is considered at its ripest and should be extremely sweet because, at this point, most of the starch has converted into sugar. What do plantains taste like raw and cooked? Raw, unripe plantains have a hard peel and starchy, bland tasting pulp, similar in flavor to potatoes. Fruits can’t be unpeeled by hand. Raw, ripe plantains have a softer peel and pulp. 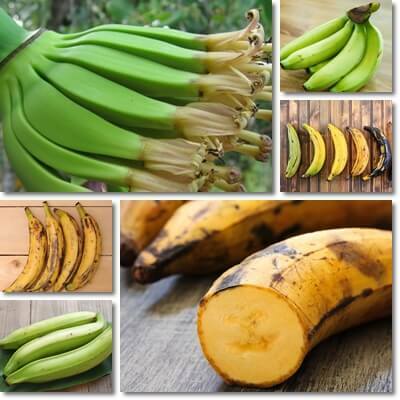 Depending on level of ripeness (indicated by peel color), they vary in taste from bland, barely flavored in the case of barely yellow plantains to extremely sweet, like caramelized sugar or honey in the case of overripe, almost black plantains with very little golden yellow. Both unripe and ripe plantains are often cooked. The green ones taste like starchy vegetables, with little flavor, like potatoes with maybe something more of a flavor if cooked by themselves. However, green plantains are cooked with various spices and other more aromatic foods whose flavor they absorb. Ripe plantains can also be cooked and should be extremely flavorful and sweet. The taste of cooked, ripe plantains is associated with that of cooked sweet potatoes. The fruits also have a nice odor, with a pleasant fruity smell when ripe. Can you eat plantain peels and leaves? In theory, you can eat plantain peels if you cook them well because cooking renders the leathery, fibrous peel soft and makes it digestible. You can’t eat raw plantain peels because they are too fibrous to be digested and you can end up with stomach upset or even worse, intestinal blockage. You can also, in theory, eat the peel of ripe, golden and black plantains. However, it’s not wise to eat the peel at all because, on the one hand, it retains all the pesticides used on the plant and can make you sick and, on the other hand, there is a risk of intestinal blockage because of the fibrous nature of the peel. 1) Boost in energy. Plantains contain almost 32 g of carbohydrates per 100 g which provide quick energy for the body to use. Moreover, they have a varied B vitamin profile with small amounts of vitamins B1, B2, B3, B5 and B9 and generous amounts of vitamin B6 (0.299 mg, around 23% of the RDA). All B vitamins contribute to energy metabolism and elevated energy levels. A sufficient intake of B vitamins helps prevent muscle weakness and pain, muscle spasms, irregular heartbeat and fatigue. 2) Benefits for brain and nervous system. Plantains are a source of choline and B vitamins, especially vitamin B6. All of these nutrients support brain functions and nervous system activity. Choline, for example, is good for memory and is theorized to help prevent early cognitive decline. Vitamin B6 helps synthesize neurotransmitters in the brain. Vitamin B9 has been shown to prevent defects of the brain, spine and spinal cord in newborns. 3) Plantains are good for mental health. The vitamin B6 in plantains is essential for synthesizing serotonin, the happiness hormone and contributes to better mood. It also helps synthesize epinephrine and norepinephrine which contribute to alertness, focus and combat lethargy and sleepiness. 4) Source of fiber for constipation. 100 g of plantains contain 2.3 g of dietary fiber. Dietary fiber is essentially indigestible plant material that passes unchanged through the gastrointestinal tract. Its purpose is to absorb water and add bulk to stool, contributing to better transit time and more regular bowel movements and relieving constipation. Plantains are also a good food to eat for hemorrhoids because they have mild laxative properties. 5) Good for skin health. Plantains are good for skin because they are rich in B vitamins. Severe B vitamins deficiency causes eczema, seborrheic dermatitis and even acne. Moreover, plantains contain important moderate amounts of vitamin C (18.4 mg per 100 g). Vitamin C boosts collagen production for healthier, younger looking skin with less wrinkles. A high intake of the nutrient can even help heal acne scars. Lastly, the fruits have small amounts of beta-carotene which is converted into vitamin A and exerts antioxidant benefits for skin. 6) Cardiovascular benefits. Plantains contain 499 mg of potassium per 100 g (11% of the recommended daily intake) and 37 mg of magnesium (10% of the recommended daily intake). Potassium balances sodium levels in the blood and prevents water retention, contributing to healthy blood pressure levels. Magnesium supports the health of the heart muscle. Together, the two nutrients help prevent palpitations, extrasystoles and arrhythmia. Plantains also have only 120 kilocalories per 100 g and help maintain a steady weight with further benefits for cardiovascular health. 7) Immune system benefits. The vitamin C content of plantains makes them a great antioxidant and anti-inflammatory fruit with benefits for immunity. Vitamin C reduces inflammation markers in the body, improving symptoms of pain. By counteracting the production of too much histamine, it exerts a natural antihistamine action with potential benefits for asthma. Also a strong antioxidant, vitamin C scavenges harmful free radical molecules and reduces cell damage that could result in cancer and other chronic diseases, more reason to incorporate plantains into your diet. However, remember the nutrient is heat-sensitive and cooking plantains will cause them to lose all of their vitamin C content.